The XT982xL series LXI™ controlled automated tuners are optimized for a broad class of in-fixture and on-wafer applications requiring flexibility, broad frequency coverage and ease of use. Based on Maury's proven non-contacting probe technology, these high-performance tuners evolve beyond outdated contacting probe technology to deliver high VSWR with superb accuracy and reliability. With a tuning resolution in excess of a million impedance points and accuracy better than -40 dB over the entire Smith chart, Maury automated tuners give you the device characterization answers and critical accuracy you need to make engineering decisions with confidence. Typical applications include load-pull using CW, GSM/EDGE, CDMA, WCDMA, WiMax, WiBro, and WiFi stimulus for mobile and infrastructure terminal design, X-band and Ku-band design, Sat-Com design, and source-pull for CMOS and GaAs low noise characterization. The XT982 series tuner is ideal for load pull, harmonic load pull, hybrid active load pull and all automated tuner applications. Upgraded mechanics result in a 5%-20% faster mechanical movement, 20%-40% faster tuner characterization and 10%-15% faster VSWR test. Linear encoders on the horizontal axis ensure accurate carriage positioning and improve repeatability by 5-8dB. 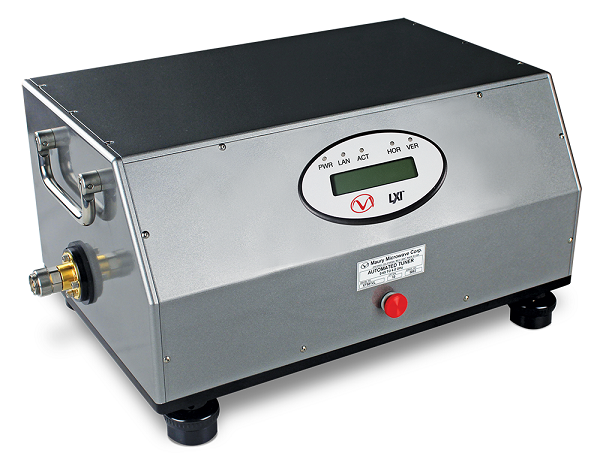 Optional High Speed Profile further improves XT tuner speed and results in a 30%-80% faster mechanical movement, 40%-60% faster tuner characterization and 25%-35% faster VSWR test (High-speed profile has been optimized for connectorized measurements).